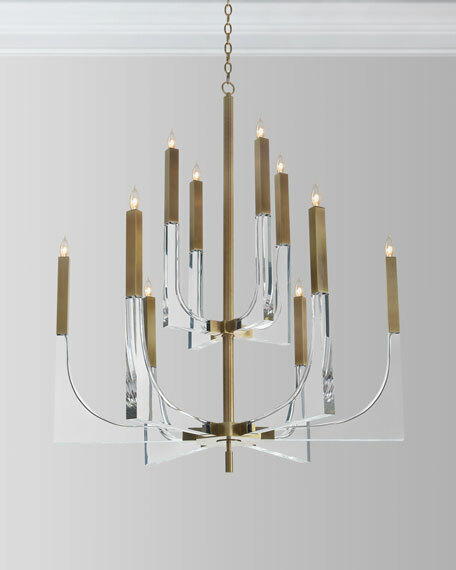 Classic form meets graphic modern design in this 2 tier acrylic and antique brass,10 light chandelier. The chandelier takes 10 60 watt, type B bulbs. Uses ten 60 watt, type B bulbs. Canopy included, 6"W x 1.25"T.
Approx. 47"H x 38"W x 38"D.
Back plate: 6" x 1.3". Weight, 41 lbs. Boxed weight, approx. 67 lbs.